Now that Serge Lutens has a new carnation scent, Vitriol d'Oeillet, on the shelves (though of course nowhere near where I can get my hands on it), I have had carnations on the brain, so it was high time I dipped into my vial of L'Artisan's discontinued and much-lamented Oeillet Sauvage ("Wild Carnation"). And what do you know? I finally found a carnation scent I don't like! One of the things I love about the carnation is that it's so protean; depending on the company it keeps, it can be languorous (Voile d'Ete) or aggressive (CdG Carnation), needle-sharp (Coup de Fouet) or slutty (Tabu), or, by itself and unadorned, just breathtakingly gorgeous (Roger et Gallet's Carnation soap). It's a mainstay of men's scents because twined in with its complex floral heart is a bold spiciness that reads as thoroughly masculine: it's a star player in Oscar de la Renta Pour Lui, Tsar, Old Spice, and Boucheron Pour Homme, to name a few. 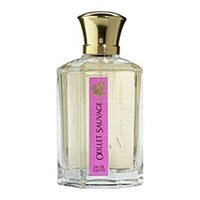 But of course like any perfumery element it can also be girly as hell if you treat it right, and this is the tack taken by Oeillet Sauvage: sparkle up the top notes with once-ubiquitous pink pepper, drench it in ylang-ylang and rose, and bolster the ground floor with powdery vanilla and benzoin. Any of these things by themselves aren't enough to make a carnation feminine: Voile d'Ete is steeped in ylang for that tropical feel, Old Spice has plenty of vanilla, and Carnation has buckets of rose. Oeillet Sauvage, though, has been deliberately engineered to read as a women's scent. I mean, it's not atrocious; a fair number of people, as usual, seemed to like it just fine when it was available. But I had higher expectations from the house. My sample vial is empty, and I'm not sorry to see the last of it. If you had a yearning to try this completely unavailable scent (something which I understand all too well), you have my word that you haven't missed much, and that there are many, many better carnations out there for you.